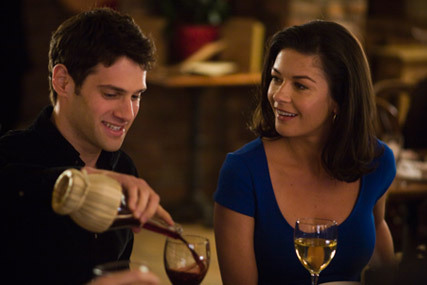 Justin Bartha is fast becoming the hottest new thing in Hollywood. With a role in The Hangover under his belt, hes now set to capture the nations hearts in romantic comedy, The Rebound. 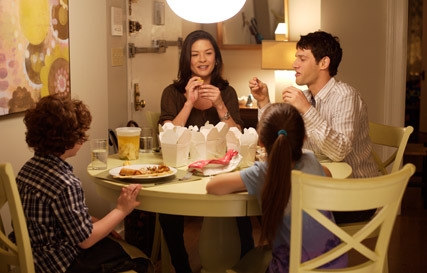 Justin Bartha is fast becoming the hottest new thing in Hollywood. With a role in The Hangover under his belt, hes now set to capture the nations hearts in romantic comedy, The Rebound. The film charts the journey of 24-year-old Aram, who accidentally lands a role as nanny to a gorgeous older womans kids, finding love  and plenty of laughs  along the way. Marie Claire had caught up with the man himself, for a chat about working with gorgeous Catherine-Zeta Jones, playing a manny, and dating fashion darling Ashley Olsen. Your character Aram accidentally ends up as a male nanny (or manny!) in the film. Would you ever use male childcare? Arent mannys becoming quite cool? Really I think it just depends whats best for the kids, and whether theyre in a safe and happy environment. But yeah, I think having a male nanny could be a great thing. Arams only 24. Why does he like being a nanny so much? Hes quite an old 24. Hes not the same as other guys his age  he doesnt like going out and getting drunk, or having meaningless friendships He doesnt do a lot of the things other 24-year-olds do. Hes just a bit lost. Do you think he relates to the kids so well because hes only young? Yeah – hes more on their level. But hes also very responsible and very ready for the experience. So that wasnt what he had planned? No, not at all. Life had just taken him there. Hes this sweet, loving guy who goes though a heartbreaking divorce, and just kind of loses his way. He has an idea of the kind of man hed like to be, but he just doesnt quite know how to get there. So when he finds his way into this family, it totally changes his life, for the better. You got to work with gorgeous Catherine Zeta-Jones. What was she like? Catherine was just fantastic. Shes such a brilliant actress – beautiful and smart. And so much funnier than Id realised. Really, really funny. Shes also very down to earth and professional. We had such a great time working together. And in the film your character gets to date her. Would you ever date an older woman? I havent done so far. Well, not in a serious way. But I wouldnt necessarily rule it out – just look at Catherine, shes gorgeous! In the film, age is just a number. For Sandy and Aram its about love and emotion, and just connecting with someone. Its about how they feel, their state of mind. Catherines character Sandy is very strong and independent. Are you happy for women to wear the trousers in a relationship? Yes, definitely. Sandys great, as she knows her own mind, and she isnt afraid to start over. She moves to the city, gets a new job, a new house. Theres nothing sexier than a woman in control. Thats what I love about it. Its different to other romantic comedies, more real. It looks at the positive side of things rather than dwelling on the negatives. And its such a role reversal  Aram is instantly drawn to Sandy, but doesnt know how to approach a relationship with her. Hes a true romantic and such a sensitive soul. Its nice to see the man playing a nice role for a change. In real life youre dating Ashley Olsen, the actress and budding fashion designer. Does she ever give you any style tips? No, not really. We try to keep our work lives separate  I dont come home and talk to her about acting, and she doesnt come home and try to get me into fashion. But we do have tremendous respect for what each other does. Last year you starred in (hit US comedy) The Hangover. Was it fun to make? Oh it was amazing. Really fun. But a lot of hard work went into it, too. It was far more complicated to shoot than you would think. I keep in touch with all the guys though, were going to be making another film soon. Oh trust me, we will. This ones going to be even bigger and even crazier than the first. Its going to be good. And what are you up to at the moment? Im in a play in New York called Lend Me a Tenor. Its exhausting work, but so refreshing to go back to theatre. Then Im off to film the second Hangover, and after that who knows! Catch The Rebound in in cinemas nationwide from 23 July 2010.